Arena Financing Funded 50% by the city and 50% by the province. Naming Rights On March 1, 2011 Quebecor purchased the naming rights and management of the arena. The amount they will pay will depend whether an NHL team moves in, and is expected to be between $33 million and $63 million up front, plus between $3.15 million and $5 million in annual rent. 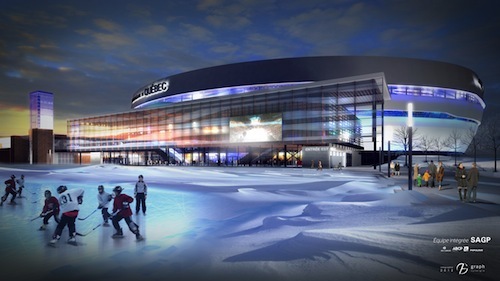 Quebec City has entertained several proposals in recent years to return NHL ice hockey to the city; most of these proposals envision using the Colis�e as a temporary home while a new NHL-ready arena is built next to the existing facility. On October 10, 2009 Quebec city newspapers such as Le Soleil reported that negotiations were held between the city and the NHL concerning the possibility and pertinence of relocating or creating an NHL franchise into the city. On October 16, 2009 Quebec City's mayor, Regis Labeaume, revealed that the firm SNC Lavalin had been hired in order to set up a feasibility study for a new arena. It is usually agreed that such a project would cost about CDN $400 million dollars and according to recent developments, Labeaume claimed that Quebec City's office would contribute CDN $50 million, provided that both the Canadian and Quebec governments would each invest CDN $175 million. Former Nordiques owner and current Canadian Olympic Committee president Marcel Aubut has said that there are no plans to demolish the Colis�e Pepsi even if a new arena is built. Aubut has mentioned a prospective future Winter Olympics bid among other justifications for maintaining the existing arena. As part of the agreement constructing the new arena, an additional C$7 million will be set aside for renovating the Colis�e, should the city land a potential National Hockey League expansion franchise before the new arena is completed in 2015. Quebec City, Quebec - Quebec City Mayor Regis Labeaume announced plans to build a C$400 million NHL-sized arena in hopes of bringing back a professional hockey team to the city that was home to the Nordiques until 1995. He also noted the amphitheater would be part of an eventual bid for hosting the Winter Olympics. The mayor is asking federal and provincial governments to invest C$175 million each through infrastructure programs. The city would put in C$50 million. The mayor said he's hoping to see the arena built between 2010 and 2012, but that will depend on how and when he can get governments to produce the money. Labeaume said he received no assurances from the NHL, but stressed there is "no doubt" about the league's interest. "(NHL Commissioner Gary) Bettman told us with a new arena, there is no limit to what we can hope for," former Nordiques owner Marcel Aubut told a news conference. NHL deputy commissioner Bill Daly said a new arena in Quebec City is a must before the city can be considered for an NHL team. Along with the out-of-date arena, a falling Canadian dollar helped lead to the sale of the Nordiques in 1995. The team moved to Denver, became the Colorado Avalanche and won the Stanley Cup the following season. Quebec City, Quebec - The province of Quebec has offered to pay up to 45 percent of the C$400 million estimated to cost of a new NHL-quality hockey arena, according to the Montreal Gazette. Quebec City officials told the newspaper the venue would require provincial and federal funding. Quebec Premier Jean Charest earlier said he supports the construction of the new arena so Quebec could once again host the Nordiques hockey team, as well as bid for the Olympic Games. The Quebec Nordiques were relocated to Colorado in 1995 and renamed the Avalanche. NHL commissioner Gary Bettman has said in the past that unless the arena is a approved, there is no chance of bringing a hockey franchise back to Quebec City. Charest said the province is going ahead with the project even though there's no guarantee of either the return of an NHL franchise or an eventual winter Olympics bid. "Let's do it and if it helps to obtain a hockey team, so be it, if it helps us obtain the winter Olympics, so be it," Charest told the Gazette. The city would put in C$50 million. With the province's commitment, Charest is turning up the pressure on the federal government to come up with the remaining 45 per cent - an estimated $175 million needed to build the arena, according to the newspaper. A spokesman for Chuck Strahl, minister of transport and infrastructure, said the door is open to funding the project. "As far as a new arena is concerned, our government is very interested to know if this can be done," press secretary John Babcock told the Gazette. He noted the federal government is reviewing a feasibility study that concluded the new arena in Quebec City would be profitable with or without an NHL team. The firm Ernst & Young put together a business plan for a new arena and stressed the project would be viable but only if the construction costs are not taken into account. If the governments pay for building the new arena, the infrastructure will then generate profits of $1 million a year without an NHL team and $1.2 million a year with a hockey team, according to the newspaper. Otherwise, the new arena's operating revenues would not make up for the cost of construction and maintenance. Quebec City, Quebec - During a speech to more than 200 Conservative Party supporters in Quebec City, Prime Minister Stephen Harper explained that in the current period of fiscal restraint this was not the time for Ottawa to take on a responsibility of helping fund a new arena that should be fulfilled mainly by the private sector, according to the Toronto Globe and Mail. The Prime Minister didn't close the door to an eventual financial contribution for the construction of a professional-size arena in Quebec City, but insisted it would have to be approved on the basis of principles applicable to other Canadian cities making similar demands, the newspaper reported. "I know there are more demands for new infrastructure for the NHL and the CFL here and in many other cities across the country," Harper told the crowd. "My friends, we are all great fans of professional sports. But professional sports are first and foremost the responsibility of the private sector. And if there is a role for the federal government, it must be equitable across the country and also affordable." A day later, Christian Paradis, the National Resources minister, suggested money for Quebec could come from other federal sources. Paradis told the Globe and Mail that any facility would need to serve a public purpose and could not be for professional sports alone. It would also have to be spread fairly across the country. And it would need to respect the upcoming climate of fiscal restraint. "We've always left the door open, saying that we would evaluate any project that would be submitted," Paradis told reporters at a global energy conference. "But one thing is clear: if the project is only about a hockey team or a professional sports team, this is a private matter. It would have to generate tangible benefits for broader things than having only professional sports." Quebec City says its arena project would be designed to help attract the ultimate event in amateur sports: the Winter Olympics. Quebec City Mayor R�gis Labeaume was asking Ottawa to invest C$175 million into a new arena that one study projected would cost about C$400 million. Last week, Quebec Premier Jean Charest announced his government would finance 45 per cent of the cost of a new arena and Labeaume was hoping to receive a similar commitment from Ottawa. 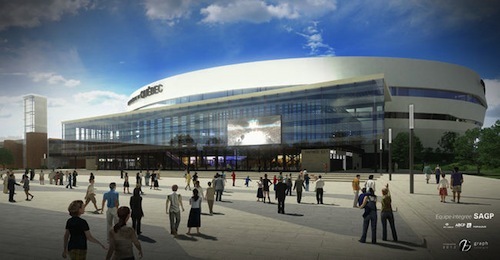 Quebec City, Quebec - Quebec City Mayor Regis Labeaume wants to begin construction of a new NHL hockey arena in 2011 and has stepped up pressure on the federal government to invest C$175 million in the project, according to the Montreal Gazette. The province has already committed 45 percent of the C$400 million venue with the city investing C$50 million. The effort also got a boost this week when Quebecor CEO Pierre Karl Peladeau said his communications firm could participate in the financing of an arena, according to CTV. Quebecor is the holder of several broadcast and print properties. Peladeau had earlier said he was not interested in helping finance the building. 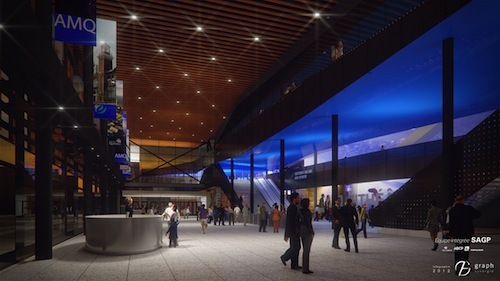 A feasibility study for an 18,000-seat arena showed it would be profitable, and both Quebec Premier Jean Charest and Labeaume have since been lobbying the federal government to come up with the remaining money needed to build such a venue. Labeaume said the city will borrow C$25 million to conduct a series of studies and prepare financing. He said the city wants to be ready to kick off construction in September 2011. "We want to show that we are very serious," Labeaume told the Gazette, acknowledging that the federal government has yet to decide whether it will fund the project that has sparked national controversy. "I wouldn't be here today if I didn't think we'd get a response before Dec. 31," said Labeaume, when asked if he is confident the city will get the money. The mayor has set the end of the year as a deadline for the city to launch construction - in order to be part of a possible bid for the 2022 Winter Olympics. Quebec City, Quebec - Media magnate Pierre Karl Peladeau says he's willing to pour "tens of millions of dollars" into a new multipurpose arena in Quebec City, the Toronto Globe and Mail reported. Citing the return of NHL hockey to the city as his priority, the president of Quebecor confirmed his intentions to the newspaper. "We have proposed something to the city that we consider to be very substantial," Peladeau told reporters, declining to elaborate on how much he's prepared to spend because "we want to keep these talks private." It also seems Quebecor, which recently won regulatory approval for a 24-hour sports channel, would be interested in managing the arena. The newspaper said there is considerable speculation in Quebec that other partners in the venture will shortly be announced, possibly including impresario Rene Angelil. Negotiations continue over the financing of the arena, but Peladeau's announcement is expected to ratchet up the pressure on the Conservative government in Ottawa - as a possible federal election looms - to kick in its share. Making a contribution using existing funds would presumably help diminish any political fallout in other provinces, the newspaper said. Federal officials have said their position has not changed and that the issue remains in the hands of the municipal government. The province and the city have already pledged C$200 million, and Quebec City Mayor Regis Labeaume has repeatedly said the project will go ahead with or without federal funding. An official from Labeaume's political party let slip to the newspaper that a new arena deal had been reached and would be announced in three weeks - he backtracked later. The National Hockey League has suggested it would like to return to the home of the former Quebec Nordiques, but that can't happen without a new arena, the newspaper reported. Quebec City, Quebec - Quebec officials have decided to split the cost of a new NHL-sized arena with the province without using federal money for the venue, the Toronto Globe and Mail reported. Quebec City Mayor Regis Labeaume's announcement represents the "Plan B" he recently promised after negotiations with the federal government failed to produce a clear funding pledge, the newspaper said. While the 50-50 arrangement does not rule out federal funding at a later date, the new plan could carry a political cost for the federal Conservatives, the newspaper said. The party has carved out a small base of support in the region under Prime Minister Stephen Harper but polls show that could shrink considerably if Ottawa refuses to fund the arena. "The mayor called on them [the federal government] 16 months ago and they have not yet responded in a positive way," Labeaume's spokesperson, Paul-Christian Nolin, told the newspaper. He added that private-sector funding was involved but refused to offer company names or amounts. The project is moving ahead without a firm commitment from the NHL, which has no plans for expansion. Nor does it have any support from media mogul Pierre Karl Peladeau - the president of Quebecor Inc. - who recently said he would invest "tens of millions" of dollars into the project. The push for a new arena is picking up steam even though NHL Commissioner Gary Bettman says the league has no plans to expand. "We tell people who are building buildings, don't build it with the expectation you're going to have a team because we're not going to make you that promise," Bettman told The Canadian Press late last month. The mayor has set the end of the year as a deadline for the city to launch construction of the 18,000-seat arena - in order to be part of a possible bid for the 2022 Winter Olympics. Quebec City, Quebec - Quebec City's mayor has announced a partnership with media giant Quebecor to invest in the city's proposed C$400 million NHL arena with the ultimate goal of bringing a professional hockey team back to the provincial capital, the Montreal Gazette reported. The deal gives Quebecor management and naming rights to the city's future arena for a 25-year period. The company will invest between C$110 and C$200 million in the project, depending on whether the city lands an NHL franchise. In the absence of a professional team, the company will contribute C$33 million for the naming rights, while this amount will rise to C$63.5 million if an NHL franchise signs on. On top of that, Quebecor will pay the city between C$3.15 and C$5 million annually for the right to manage the building. The company will also give the city 10 or 15 percent of profits from the facility, depending again on the NHL scenario. But NHL Commissioner Gary Bettman, talking on CBC's Hockey Night in Canada Radio, said the NHL is no closer to returning to Quebec City. "We were very candid and told everybody in Quebec City, 'Listen, obviously we couldn't consider ever coming back without a new building, but don't build a new building on our account where you think somehow you can expect on some certain time frame to have a franchise,'" Bettman said. "I know there are great fans in Quebec City but people in Quebec City shouldn't take (Quebecor's) announcement as any indication that there's a team on the horizon. I get concerned about expectations being raised." Mayor Regis Labeaume announced last month the city and the province of Quebec will split the cost of building the 18,000-seat arena by 2015. He reiterated he still wants the federal government to get on board and said he will send detailed information to Ottawa now that the city has a private partner, the newspaper reported. The federal Conservatives had set a significant private investment as a major condition to invest public money in the project. In Ottawa, Intergovernmental Affairs Minister Josee Verner told the Gazette private investment is not enough. She said her government could consider funding other infrastructure, such as roads and sewers related to the arena project, but not the actual construction. Quebec Premier Jean Charest, who has committed the province to foot half the bill for the arena, told the Gazette this signals the federal government has likely closed the door to an investment. Construction of the proposed building - to be located just outside the downtown area - is set to begin at the end of 2012, with an opening slated for the fall of 2015. Ottawa, Ontario - The National Post says federal funding for an NHL arena in Quebec and a CFL stadium in Saskatchewan would have to be conditional on steep ticket surcharges of up to C$42 each - a move likely to ignite stern opposition from local sports fans, says a report prepared for the federal Crown agency charged with allocating money for infrastructure projects. The analysis, obtained by the National Post, said the surcharges would be necessary to protect taxpayers' interests from risks related to bloated construction budgets and stadium-revenue shortfalls. But it is unclear markets in Quebec City and Regina could absorb such costs. "If viable, professional sports facilities should be private infrastructure. This model is best for the taxpayer because it does not entail any project risk," said the report for PPP Canada, which manages C$1.2 billion for infrastructure investments in partnership with private-sector firms. The paper offers some insight as to why the minority Conservative government decided this month against making funding available for arenas and stadiums designed for professional sports franchises. Jim Flaherty, the Finance Minister, said the decision applies nationally. The newspaper said the move carries political risk, especially in Quebec, where the Quebec City mayor - who is trying to lure the NHL back to the provincial capital - has said the federal decision would prove "suicidal" for the Conservatives. PPP Canada invests in so-called P3 projects, in which government and business pool together financing to build needed infrastructure such as roads, hospitals and the like. It provides government the option of sharing risks associated with the private sector, especially on the cost and revenue side. At present, professional sports venues don't qualify for agency funding. The report refrains from recommending whether federal cash should be made available for sports stadiums. However, it does highlight the myriad risks involved, most notably construction budgets that tend to balloon; cases of government funding that went awry when stadiums were later sold to the private sector at a deep discount; and the conditions required to make government funding work but likely to draw the ire of cash-strapped sports fans. On the latter point, the authors constructed case studies under which federal funding might work in the case of a new 18,000-seat arena in Quebec City and a 33,000-seat stadium in Regina, to be primarily used by the CFL's Saskatchewan Roughriders. While the proponents of the Regina stadium are counting on a hotel tax and naming rights to help pay building costs, the PPP report said it is possible a ticket surcharge would also be required. The analysis suggested an average surcharge of C$28 to C$42 per ticket would be needed, and presently it costs anywhere from C$10 to C$72 to attend a Roughriders game, the newspaper said. "There would be limits both to the market capacity to absorb such charges and the ability to levy and sustain such charges in the face of likely public opposition," the report said. Meanwhile, for the Quebec arena - funded entirely by provincial taxpayers - a surcharge of between C$17 and C$26 per ticket is required to make a federal contribution work (assuming annual attendance of over a million and five percent interest on C$400 million in capital costs). Ticket surcharges "are technically possible but would require a significant shift" in Quebec City's approach, it said. The provincial Quebec government and Quebec City have agreed to fund the cost of the C$400 million arena on a 50-50 basis. Montreal, Quebec - Two economists at the Conference Board of Canada say it may be a good idea for the NHL to put teams in Winnipeg and Quebec City, the Montreal Gazette reported. A report argues clearly that the necessary factors � defined as market size; income levels; a strong corporate presence; and a level playing field � are not only present in the two cities, but are comparable to other Canadian cities with NHL franchises, and even better in some cases. The caveat, of course, is that Winnipeg, which lost its Jets in 1996 to Phoenix, and Quebec City, which saw its Nordiques head southwest to Colorado in 1995, remain small markets with a shallow corporate pool to draw from for season tickets and luxury suites. "It's a tough call," Mario Lefebvre, director of the board's center for municipal studies and co-author of the report, told the Gazette. "This will take some fine planning; it will take some people working really hard behind the scenes, making sure that corporations are in for the long run." He says people in Quebec City have boasted to him about being able to sell luxury suites before they even attract a team, let alone build the new arena that will be necessary to support an NHL franchise. "That's called frenzy of a new adventure," Lefebvre says. "You are going to sell it for the first year, first two years, and who knows maybe even the first three years, but it's the long-term dedication that you will need." According to Lefebvre and Glen Hodgson, a senior vice-president and chief economist at the Conference Board, populations in Quebec City and Winnipeg are large enough to support another professional sports franchise, and those people have the disposable income to pay for tickets. The newspaper says the "level playing field" argument is perhaps the most compelling - part of what drove the Nordiques and the Jets out of Canada in the first place was the extremely low Canadian dollar, and rising salaries paid to players in U.S. dollars. But with a salary cap taking care of one of those factors, and the Canadian dollar expected to stay at par with the U.S. dollar for the foreseeable future, "under these conditions, Quebec City and Winnipeg could compete with larger markets on an ongoing basis," the report concludes. Both cities have buyers lined up. In Winnipeg it's the partnership of True North Sports & Entertainment's Mark Chipman and Thomson Reuters chairman David Thomson, and in Quebec City, president and CEO of the Quebecor media company, Pierre Karl Peladeau. Lefebvre and Hodgson are not alone in asserting that the two cities could support NHL teams - a report last month from Tony Keller, a fellow at the Mowat Centre for Policy Innovation at the University of Toronto, made the same claim, the Gazette reported. Jim Kyte, who developed the Sports Business Management program at Algonquin College in Ottawa and is now the chair of the marketing and management department there, consulted on the report. He said he thinks Lefebvre and Hodgson have constructed a compelling argument, but he has his reservations. "I don't know if there's an appetite to support professional sport franchises," Kyte, who started his NHL career in the 1982-83 season with the Winnipeg Jets and stayed for six years before moving on and playing his last season in the league with San Jose in 1995-96, told the Gazette. The first five years would likely be fine, but "after that, when the honeymoon period is over, and perhaps they haven't made the playoffs for five years in a row," it could be harder. Quebec City, Quebec - A push from party leadership to support legislation that would have protected a proposed arena in Quebec from lawsuits has caused three prominent members to resign from their party's caucus, a move that has greater political implications, the Toronto Globe and Mail reported. Just weeks after the Bloc Qu�b�cois was decimated and left leaderless by a disastrous federal election campaign, the resignations cast doubt on the survival of Pauline Marois as PQ Leader, the newspaper said. Internal dissent is mounting within PQ ranks, with at least two other members openly contesting Marois's handling of legislative actions designed to shield Quebec City's arena project from legal challenge. The arena issue is only the tip of the iceberg. The newspaper said caucus members also question Marois's handling of the sovereignty issue with her refusal to outline a clear plan on how to achieve political independence. All three contend that by supporting a private member's bill that protects a management agreement on the proposed C$400 million arena between the city and Quebecor Media Inc. from a potential lawsuit, Marois violated the right of every citizen to take action against such deals. "I am leaving because I can't be associated to a proposal that deprives citizens from their right to exercise their legal responsibilities. ... I could not look myself in the mirror," Pierre Curzi said. "My level of personal ethical tolerance has been reached." Marois acknowledged to the Globe and Mail she was stunned by the bitterness revealed in the resignation announcement. "The description I heard of my leadership was completely staggering," Marois said. "It's a shock for sure. I can't say the contrary." Quebec City, Quebec - Quebec City's municipal council has approved a six-part agreement between the city and Quebecor Media Inc., handing the Montreal media conglomerate the keys to a proposed new National Hockey League arena, the Montreal Gazette reported. The aim of the 25-year deal, renewable for an additional 15 years, is to draw an NHL team to replace the Nordiques, who last played in the city in 1995. But opposition council members noted there is no guarantee the NHL will send a team Quebec City's way. Mayor Regis Labeaume has said that without an NHL franchise, the C$400 million arena - dubbed a "multi-functional amphitheater" - will run a C$600,000 annual deficit. "I think it will be more than that," opposition council member Yvon Bussi�res said to the Gazette. "Millions." The six contracts between the city, Quebecor and its subsidiaries specify that they are conditional on the adoption of Bill 204 by the National Assembly. Bill 204 would retroactively confirm the legality of the city's arrangement with Quebecor, negotiated directly with the media giant rather than through public tenders. Bill 204 was proposed last spring by the Parti Qu�b�cois, at the mayor's request. It backfired, leading to resignations of elected PQ members and a challenge to the authority of party leader Pauline Marois. The PQ dissidents were not convinced the accord was a good deal and balked at Marois's imposition of party discipline, forcing them to vote for Bill 204. Marois has since agreed to a free vote on Bill 204. The PQ caucus spokesperson, �ric Gamache, had no comment to the Gazette on the accord with Quebecor, saying it was up to the Liberal government of Jean Charest to decide when Bill 204 would be presented. Charest said last spring it would be adopted soon after the assembly resumes Sept. 20. Quebecor would rent the facility for 25 years, with a possible 15-year extension, and is committed to seeking an NHL franchise. Quebec City, Quebec - A controversial bill to protect the Quebec City arena project from legal challenges has passed its final vote in the National Assembly, according to CTV reports. C$33 million cash down, just over C$3 million more per year and a promise to give the city 15 percent of the arena's profits. The former Director General for Quebec City, Denis De Belleval, who launched the legal proceeding to stop the arena that prompted the creation of Bill 204, is disappointed with the process. In his 28 page document demanding the courts annul the deal De Belleval said the arena contract was issued without any public bidding process and that the contract amounts to the city of Quebec giving one of the largest companies in the province, Quebecor, C$40 million each year for 25 years. The bill is expected to have its final reading and become law later this week. Quebec City, PQ - There isn't a shovel in the ground yet and already it's going to cost as much as C$40 million to decontaminate the proposed site of Quebec City's new arena, the Canadian Press reported. Quebec Treasury Board president Michelle Courchesne says she's confident the amphitheatre's final cost will come in at the budgeted C$400 million. To be sure, Mayor Regis Labeaume has appointed a special adviser to help avoid cost overruns. Businessman Claude Rousseau will look to trim costs to keep the project within its budget. An in-depth study of the proposed site, near the Pepsi Colisee, reveals the land has high levels of lead, tin, zinc, oil and carcinogens. She says the government is still committed to its C$200 million investment. Sam Hamad, the minister in charge of the provincial capital region, says there no plans "at the moment" to invest more. The news service said the city has been caught in an embarrassing situation with news of the decontamination costs. Quebec City executive committee vice-president Francois Picard says officials were aware the site would need to be cleaned, but were unaware of the costs involved. Picard says they are looking at alternate sites nearby to build the rink. The C$400 million price tag was based on a preliminary study that has a 75 per cent margin of error. 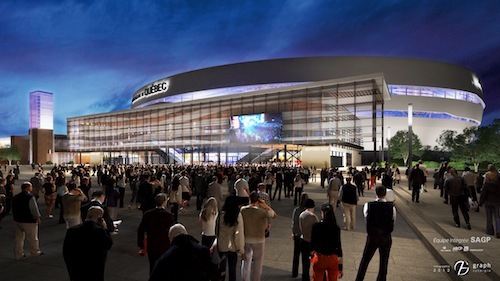 Quebec City, PQ - Quebec City Mayor R�gis Labeaume and Quebecor Media Inc. have reached a final agreement on the construction of a C$400million amphitheater for Quebec City, the Montreal Gazette reported. Construction of the 18,000-seat, multi-use sports complex is scheduled to begin in September and be completed in September 2015. The C$400 million cost will be split between the provincial government and the city of Quebec, which is trying to persuade the National Hockey League to relocate a team to Quebec. The amphitheater will be built on the site of the old Quebec hippodrome. 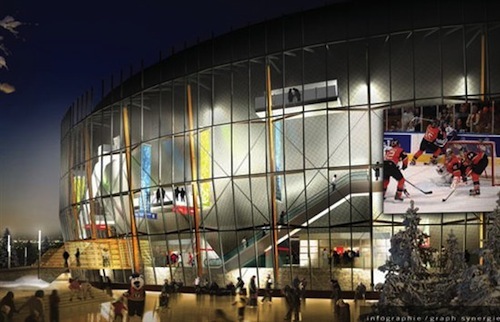 In 2011, Quebecor CEO Pierre Karl P�ladeau bought management and naming rights to a proposed Quebec City arena, which would be essential to attract an NHL team. The Canadian Press said if an NHL team is acquired, Quebecor would hand over $63.5 million for naming rights, plus $5 million in annual rent. Without one, the company would pay $33 million for the rights and an average of $3.15 million annually for rent. Quebec City's last team, the Nordiques, moved to Denver in 1995, becoming the Colorado Avalanche. "There are no more obstacles... no more uncertainty about the construction of the amphitheater," said Quebecor CEO Pierre Karl Peladeau, said at the news conference. Labeaume refused to speculate on whether his city was in line for a club. The wire service said he was quick to shut down a reporter's question on the subject.